Disclaimer: This pair of shoes was provided to me by ASICS Singapore for review purposes. My first experience with the Hyperspeed was version 6. It was and still is one of a very short list of truly soft and light racing flats on the market. I remember desperately wanting to make it work as a marathon racer. However, despite swapping out the minimal insole for a thicker more substantial one, I still found myself struggling to stay comfortable beyond 10km in it. You see, the Hyperspeed 6 used a very low durometer EVA foam. What this means is the foam is very soft, and it so happens that when I ran in it at race pace, my feet had the tendency to bottom out on the shoe, i.e. my feet would sink down in the shoe to the extent that I felt the ground contact a little too much. I’d had similar experiences before with soft shoes that just did not have sufficient thickness to prevent the feet from sinking all the way in, e.g. Skechers GoRun Ride 4, Brooks Pureflow 3. These would work great for the first 10-15km but then would start to feel really harsh as my legs got more fatigued and I got heavier on my feet. What I did like about the Hyperspeed 6 was the upper. It was a no-nonsense, water proof inelastic upper that was pretty much seamless and exceedingly light. Another common problem with the Hyperspeed 6 which I learnt from other users was durability. The softness of the EVA makes it very prone to degradation from use. There was also very little by way of outsole coverage in an effort to save weight. They could have made the foam bouncier and dense but then of course it would have added weight to the shoe. All these shortcomings were offset by its very low retail price, and it remained a very popular racing flat for many people. 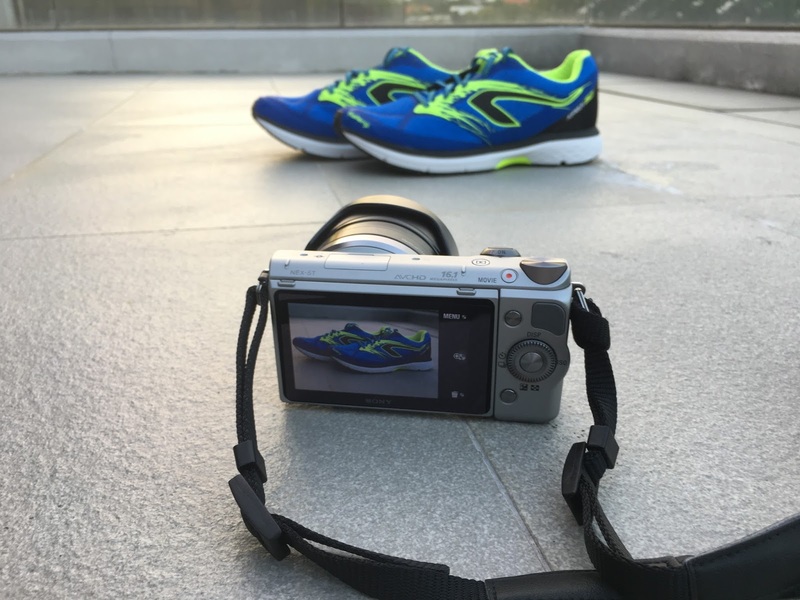 Just this year alone, the Hyperspeed 6 has been shod to a 2:51 Tokyo Marathon by ASICS’s own Andy Neo, and a 2:57 Seoul Marathon by Running Department superstar Alvin Loh. Enter the 2016 ASICS Hyperspeed 7. How would it stack up? Would they address the shortcomings of the Hyperspeed 6? First and foremost, let me go ahead and say it fits true to size! According to RunningWareHouse, the Hyperspeed 7 gained 0.8oz vs the Hyperspeed 6, and an additional 1mm in stack height across the board. My Hyperspeed 6 in US9.5 weighed 160g, and I was pleasantly surprised when my Hyperspeed 7 weighed in at only 166g, way under advertised spec. The upper of the Hyperspeed 7 has been completely redesigned and now sports a very well ventilated open mesh seamless upper, with the mesh material being most prominent at the toe-box. 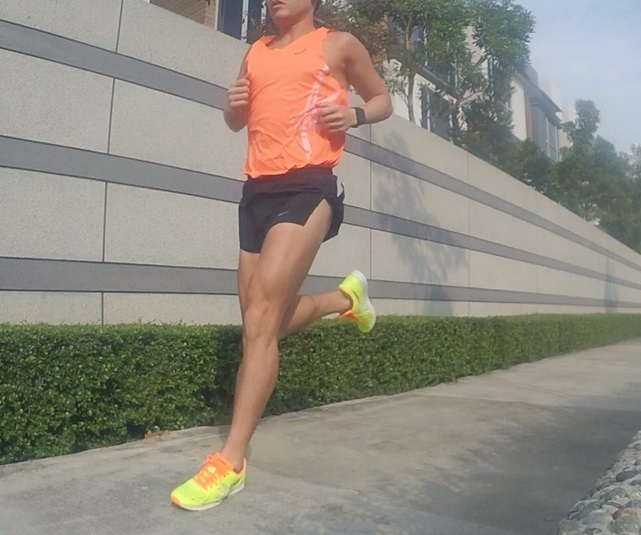 The toe bumper is slightly more rigid in version 7, and this combined with the relatively elastic mesh upper at the front, gives the impression of marginally higher shoe volume up front. The heel counter remains unchanged from version 6 as far as I can tell. As would be expected of a racing flat in this weight range, padding is kept to an absolute minimum. It would appear that the durometer of the EVA used in the Hyperspeed 7 is unchanged from version 6. It is still a very soft shoe (low 40s durometer), and would work very well for road racing. The appearance of the foam is different in that it uses a layered appearance, as opposed to the angular geometric appearance of version 6. I will elaborate a little more on what this meant for me below. For fans of ASICS gel, this shoe does have some small segments of gel in the heel for added cushioning. One interesting factoid I noticed is that RunningWareHouse lists the Hyperspeed as using SpEVA foam. I have it on good authority that it actually uses regular EVA, which would explain why the SpEVA models are heavy while this shoe is feather light. In fact it is significantly lighter than the Tartherzeal which uses Solyte (which is compression-molded and lighter than the injection molded SpEVA). 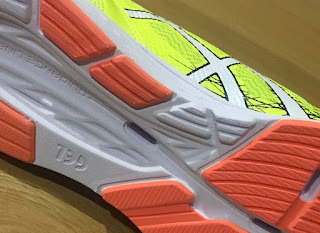 The heel uses carbon injected rubber for better wear-resistance (known as ASICS High Abrasion Rubber, or AHAR+). There is extensive use of blown rubber (made from a variant of AHAR) in the forefoot of this shoe, with grooves in different segments to facilitate flexibility. Here, you can also see just how much the midsole has been hollowed out in sections to drop weight. What’s really impressive is that they managed to do all that and only gained 6 grams! Traction-wise, I think blown rubber still has a ways to go to catch up with DuoSole, but the new outsole pattern is definitely an improvement over last year’s iteration. The grooves in the new outsole are deeper, and simple physics tells us that this creates higher pressure at the contact points for better grip. The downside with these deeper grooves is greater susceptibility to wear. Having said that, I think that for a shoe like the Hyperspeed, the EVA is almost always going to wear down before the outsole gives up so that’s less likely to be an issue. Durability-wise, I’ve just about clocked ~150km in these shoes, and although it was almost all done at uptempo pace, the outsole wear seems reasonable. I have not noticed any loss of midsole cushioning yet, although some creases are showing on the midsole EVA. Hopefully it will last a little longer than the Hyperspeed 6. One thing you will notice is the somewhat wider footprint of the Hyperspeed 7, especially at the arch. While the last is still very much a racing style curved last, the extra EVA placement at the arch really improves the lateral stability of the shoe and makes cornering that much easier at pace. With version 6, there was quite a lot of EVA cut away from the arch in an effort to shave weight. With this new last, it offers just a smidge more lateral stability for race day. True to their design philosophy, the shoe has a modest toespring, to complement the highly flexible forefoot. With the current trend towards more pronounced toesprings and stiffer outsole platforms to facilitate faster transitions (e.g. NB Zante), one might wonder why ASICS is not incorporating these features into their racers. Well here’s one argument against them: these features tend to inhibit the natural Windlass mechanism in the foot and can predispose one to plantar fasciitis. The overall ride of this shoe is very smooth with a flexible platform for natural foot pronation. Transition is predictable but not spectacular; predictable because like many of its cousins in ASICS racing line, it is a single density EVA midsole, so the feel is generally consistent from heel to toe. It is not a shoe that is expected to last you hundreds of miles, but save it for speed work and races and I think there is no better shoe on the market for the price. If you like soft cushioned shoes like the Nike Lunaracer, or NB 1400, this is definitely a shoe you should try. Personally, I still prefer the upper of version 6. Sure, it did not breathe as well, but it was so much easier to clean and maintain in Singapore’s hot humid weather. You could literally run the shoe under a tap and all the grime would come off the upper without staining. With the new mesh upper, if I pour water on my head, there is a good chance some of it will end up in my socks through the forefoot mesh. The one thing I have not tried with this shoe is uptempo long distance. My longest run in it is 14km and so far so good. One tip i would suggest is maybe swap out the stock insole for a thicker more substantial one if you are planning to use it for longer races. At its current retail price, the ASICS Hyperspeed 7 is a must try for anyone aiming to run a competitive 5-10km race. It is available now in most ASICS concept stores.